It should never be forgotten that Sir Edward Downes and Lyrita played a highly important role in pioneering the restoration of the reputation of George Lloyd in the late 1970s and in the 1980s. Downes performed and broadcast several of the symphonies and Lyrita issued the recordings he made of the Fourth, Fifth and Eighth symphonies (review). Since then, a good number of recordings of music by Lloyd have appeared on disc, mainly on the Albany label and many of them under the composer’s baton. 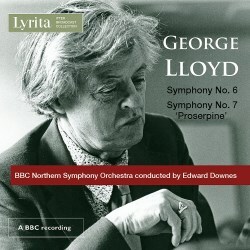 However, Downes’ recordings have an important place in the Lloyd discography and it’s good that these two performances have now been added to his recorded representation as a Lloyd conductor. There has been some correspondence on the MusicWeb Message Board concerning the decision to issue these recordings given the presence in the catalogue of recordings by Lloyd himself – the posting by William Lloyd is especially interesting to Lloyd fans. I was very pleased to find the Sixth included on this disc. This most attractive score is one of my favourite Lloyd works. It also brings back some personal memories. Back in the late 1970s and early 1980s I played in the Slaithwaite Philharmonic Orchestra. Our then conductor, Adrian Smith got the Lloyd ‘bug’ on the back of hearing some Downes broadcasts and, indeed, he and I went down to Manchester to attend a couple of recordings in the old Studio 7 in New Broadcasting House. We certainly heard the epic Fourth Symphony and, if memory serves me correctly, also the fine symphony for brass, November Journeys. Adrian decided that our orchestra should play some Lloyd and we settled on the Sixth. We even thought that our performance, scheduled for autumn 1981, might be the first public outing for the work but Downes and the BBC Northern pipped us to the post by including it in a Prom concert a few months before our own performance. We invited George Lloyd to attend our concert and he and his wife travelled up from London to Huddersfield. He was completely charming and took a great interest in our performance. I hope he was pleased that both the orchestra and the audience enjoyed the work so much – we’d found rehearsing and performing it a delight. The two performances on this disc were the respective premieres of the works in question. Though the venue is not stated I imagine both performances were set down in Studio 7, New Broadcasting House which was the orchestra’s HQ at that time. The composer recorded the Sixth for Albany Records in May 1988, conducting what had by then been re-named the BBC Philharmonic (Troy 015-2). His recording was definitely made in Studio 7. A comparison of the two recordings is very interesting – it should be remembered that the Lyrita disc contains an off-air recording of an analogue stereo studio broadcast whereas the composer’s own recording is a digital affair, specifically intended for commercial release. I played both discs on the same equipment and at the same volume setting and found that the Lyrita sound had more punch and rather more of a sense of the ambience of the venue around the sound of the orchestra. I think the Albany recording is a bit more sophisticated but the Lyrita sound should not disappoint anyone. The Sixth is in three movements and arguably it’s the lightest in tone of Lloyd’s symphonies; it’s also one of the shortest. The first movement is marked Allegro and there’s not a great deal of difference between the core tempo of either version. I have the impression, though, that Lloyd achieves more in the way of dynamic contrasts than does Downes. I think Downes brings more punch to the passages which need that characteristic – and I don’t think that’s just a question of the respective recordings. To counterbalance that, however, I believe that Lloyd brings out rather better the light, whimsical side of the music. From about 4:48 in the Lloyd recording (4:31 with Downes) the music acquires a darker tone of voice and the pace slows appreciably for one or two episodes. Lloyd is marginally more expansive than Downes in these slower passages and that’s largely why his overall timing of 8:11 is longer than Downes’ 7:25. The Adagio opens with a very beautiful melody, heard initially on the strings; this has something of a legendary character to it and is, I think, one of the composer’s most memorable melodic ideas in all the music of his that I’ve heard. Here Downes is very grave; Lloyd is fractionally quicker – but you’d only notice the difference if you were making a direct A/B comparison. At 1:27 in the Downes performance we hear a lovely, melancholy second idea on the cor anglais (was it the same player on both recordings?) Both conductors are highly successful in this movement, their respective readings nuanced and expressive. The musical ideas in this movement are simple and direct, communicating very strongly to the listener and, surely tugging gently on the heart strings. Both conductors take a pretty similar view of the vivacious finale. This contains an exuberant, virtuoso part for flute, expertly delivered in both recordings. Choice between the two versions in this movement is a marginal matter but I think Downes just has an edge when it comes to crispness of attack. Maybe that’s down to hi much greater experience as a conductor and his well-established relationship with the orchestrsa. And that last comment really sums up my response to the respective recordings of the symphony as a whole. The composer’s is an excellent performance in very good digital sound but for me Downes just has a slight edge, though no admirer of George Lloyd will want to be without his version too. This is such an attractive, entertaining symphony and it deserves to be heard much more widely in live performances. In June 1986 George Lloyd and the BBC Philharmonic set down the Seventh Symphony. That recording was originally issued by Conifer but I see it’s now listed on Amazon with the Albany catalogue number TROY 057-2. Unfortunately, I only have that recording of the Seventh on an ancient Conifer cassette – why did I buy it in that format? – and I don’t now have a cassette player hooked up to my hi-fi. Consequently, I’m unable to make a comparison between the Lloyd recording and this Lyrita CD. That said, it may be worth noting that simply in terms of timings Lloyd and Downes are close to each other Lloyd’s timings for the Seventh are: I 15:08; II 13:51; III 20:49. Downes’ timings are: I 15:20; II 14:26; III 20:26. Timings are not everything; the spirit of performances is more important. Nonetheless, these timings might be an indication that Lloyd and Downes held fairly similar views about the work. The Seventh is as different from the Sixth as chalk from cheese. Not only is the Seventh more than twice as long in duration and more lavishly scored, it is also infinitely more serious in tone. I had always believed that it was chiefly through the catharsis of the Fourth Symphony (1946) that Lloyd exorcised the demons that had plagued him since the traumas of his wartime service on the Arctic convoys. However, in his excellent booklet essay Paul Conway argues persuasively that it was in the Seventh that the composer “grappled with his horrific wartime experiences and gave artistic expression to his inner torment.” If that view is right – and, as I say, I find the argument very persuasive - I think that it’s in the symphony’s huge finale in particular that this emotional turmoil finds a voice. Perhaps the mental stress of composing the work explains why Lloyd waited some 15 years after completing the composition before orchestrating it. The work bears the title ‘Proserpine’ after the character in Greek mythology. Proserpine, the beautiful daughter of Ceres and Jupiter, lived idyllically on the island of Sicily until Pluto carried her off and made her his queen in the infernal regions. Again, the symphony is cast in three movements, the first of which is marked Misterioso – Vivo ma leggiero. Right at the very start we hear an insistent triple-time figure played on the xylophone; this will recur at strategic intervals throughout the movement, not least in the climactic passage from about 12:25. The movement, which, in the composer’s words, depicts Proserpine as the “joyful, dancing side of life” is strong argued, colourfully and resourcefully scored. There’s drama too, at times. The slow movement, a Largo, depicts Proserpine as the Goddess of Death. It seems to me that here Death is portrayed in a dignified, almost consolatory way; there’s none of the turbulence encountered in a work such as Tod und Verklärung. This is a movement that shows Lloyd’s gifts as a melodist and nowhere more so than at 9:23 when the horns and cellos combine to deliver a wonderfully noble cantabile line. It’s in the rich meditative mood that flows from that passage that the remainder of the movement is played out. The finale is on a huge scale, playing for over 20 minutes. If I’m honest I wonder if it’s not a bit too long. The composer tells us that the movement addresses “the desperate side of our lives”. If I’m right that the slow movement hinted at calm in the face of death then that idea is rudely banished at the start of the finale; here the music is dramatic, thrusting and strongly rhythmical; Downes and the orchestra propel the argument along with great drive and urgency. Even when (at 1:34) a big sweeping violin melody comes to the fore the brass and woodwind have vigorous counter-material underneath. The music is often full of dramatic incident and the BBC Northern’s brass really punch their weight. Just before 6:00 the pace slows, the mood becomes more pensive and the scoring becomes dominated by darker hues. Gradually the speed picks up as does the intensity en route to a huge, tense climax (13:00 – 14:02). The music then subsides to an extended epilogue (from 15:02). For much of the time this epilogue is very beautiful but even so the mood remains restless and uneasy in spirit – not least in a passage in which dark, threatening brass are accompanied by chilling woodwind and tremolando strings (17:41 – 18:03). The end is reached when the movement sinks into subdued darkness. For all that I wonder about the length of the finale, the Seventh is still a powerful and impressive piece. It receives a very considerable performance from Edward Downes and the BBC Northern. If you already have George Lloyd’s own recordings of these two symphonies in your collection – they are not coupled together, by the way – you may wonder if you should make the additional investment in these Edward Downes recordings. I would argue that you should. In the case of the Sixth I think there are features about each performance – including the sound of the respective recordings – that make them complementary. As for the Seventh, I regret my inability to make comparisons between the Lloyd and Downes versions. I have several of the composer’s recordings of his own music; I think he was no mean interpreter of his music and my recollection was that his recording of the Seventh was very good. However, the Downes performance of the Seventh is first class – and splendidly taut and urgent in the finale – so Lloyd enthusiasts should certainly hear it. Furthermore, in his notes Paul Conway very rightly lauds the pioneering work that Edward Downes did on behalf of George Lloyd so it’s right sand proper that these recordings should take their place in the catalogue. This disc is an essential complement to the composer’s own recordings. I should also commend to any readers who may be unaware of it Paul Conway’s MusicWeb feature on the symphonies of George Lloyd.